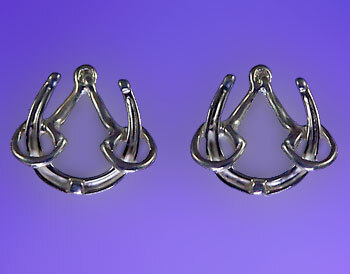 Sterling silver horseshoe and bit earrings ready for show! Here we have a bit interlocking with the horseshoe. A great gift for the horse enthusiast. Available in 14kt yellow gold, 14kt white gold, or sterling silver. Try in a satin finish for a distinctive and richer look. PICTURED AND PRICED IN STERLING SILVER!